CANDID conversations about death will be one of the quirky, yet important conversations explored through art during the city’s inaugural 24 Hour Experience. 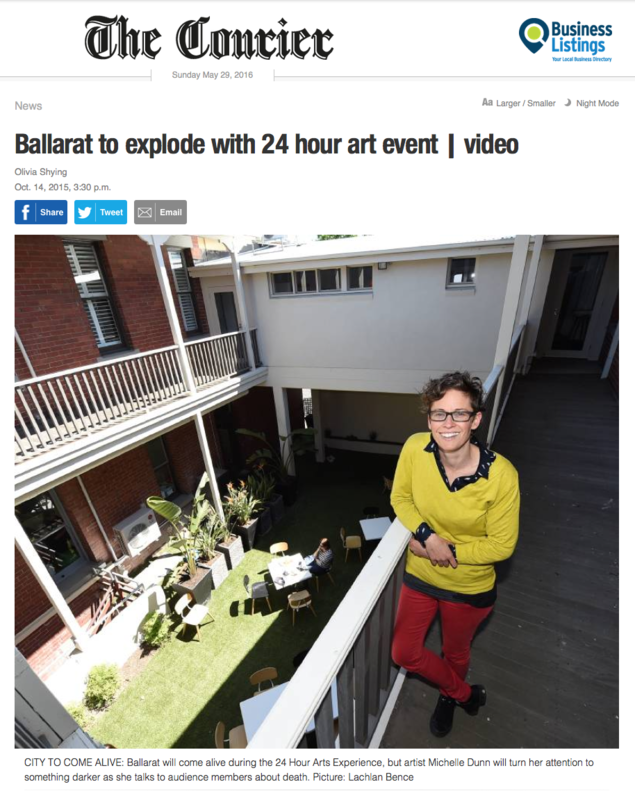 Next month Ballarat will be transformed into a vibrant hub as artists perform their work at various locations throughout the city. Ballarat photographer and film-maker Michelle Dunn will delve into a different side of the arts, fronting a group of people to talk about dying. Ms Dunn will be just one of many Ballarat-based artists performing. The unique festival is the brainchild of Melbourne-based artistic director Gorkem Acaroglu who held the event in the state’s art capital in 2014. “It was very successful and well received and we wanted to do it again,” Ms Acaroglu said. She decided to take the event out of Melbourne and host it in “a more contained community”. Ballarat was the perfect fit. “So far we have a really good relationship with the council who have been great supporters of, and participators in, the event,” Ms Acaroglu said. Visitors can sign up to attend the entire 24 hour event, a noon-midnight section, a midnight-noon section, or a six hour block of their choice. Each art piece will be presented for one hour and visitors will be bused to various locations. Some of the weird and wonderful performance venues include Ballarat Base Hospital, the middle of Sturt Street and underneath an isolated willow tree. The evening is fully catered for and participants are given a goody bag of treats and even a deck chair, so they can enjoy the arts in style. Ms Acaroglu said she hoped the event would allow people to engage with the city in a completely new and unique way. “You know that feeling of going to a place for the first time? You never get that again – that’s what I want to try and create through this,” Ms Acaroglu said. Ms Dunn said the event was a great platform for regional artists to perform and share unique ideas and concepts with the broader community. Her work, done in conjunction with the bereavement committee, is based around an anonymous survey. “I asked people what they wish they could say to someone before they died – and will use that as the starting point,” Ms Dunn said. The “explosively charged” event runs from midday November 21-22. Book via 24hourexperience.com.au.